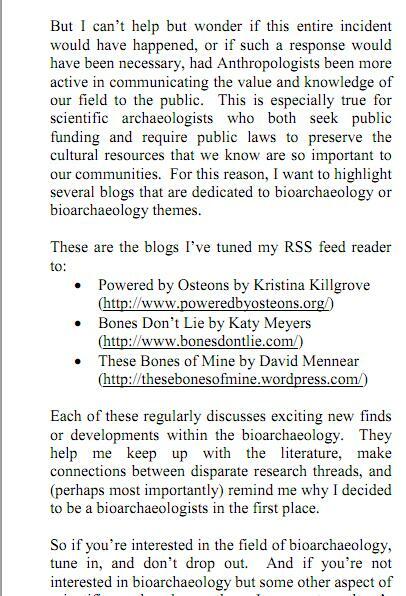 My blog, alongside Powered By Osteons & Bones Don’t Lie, have been mentioned in a brief article in the newsletter of the Society for Archaeological Sciences, Vol 34, No4 pp.27-28 (Winter 2011). The short article, by Gordon F. M. Rakita (Associate Editor), discusses bioarchaeology and the recent American Anthropological Association’s annual meeting. It highlights the need for scientific archaeologists, and archaeology as a field a whole, to reach out and make use of social networking sites, blogs and other websites in disseminating news, views, experiments and research data. It is imperative that as many researchers, educators, lecturers & field workers as possible make archaeology accessible to the public. After all, we are all indebted to history, and archaeology as a whole is largely government, council &/or business funded. I am humbled to be mentioned by name and by website, and pleased that my writing is being read. Also, miraculously, I’m still on the front page for archaeology at the University of Hull– alas the long hair is no more…. 10.02.12 Update: Both Kristina Killgrove & Katy Meyers have wrote about this piece at their respective blogs, and provide interesting views regarding the advent of the blog as an important bioarchaeology outreach tool. “Of late, there have been several calls for anthropologists to reach out and engage the public. For example, Jerry Sabloff (2011), in his distinguished lecture at the American Anthropological Association’s annual meetings, strongly urged us to actively speak and write to a public audience and develop mechanisms (at least within academia) to reward those who do so. In particular, he suggested (p. 414) that ―One of the most promising areas of outreach—and perhaps the launching pad of the future for public intellectuals in anthropology—is blogging. Writing as I do from a public university in the state of Florida, I am keenly aware that the public and our elected officials often have a clouded understanding of the nature of our discipline and our contributions to society. Certainly we make such contributions, but we often fail to tout or otherwise advertise these contributions. As a result, we often have to play catch-up when others define who we are and what we do. In the wake of Florida Governor Scott’s comments regarding anthropology, many rushed into the public debate to emphasize the scientific aspects of modern anthropology. None were more effective than the presentation developed by Charlotte Noble and other graduate students at the University of South Florida. But I can’t help but wonder if this entire incident would have happened, or if such a response would have been necessary, had anthropologists been more active in communicating the value and knowledge of our field to the public. This is especially true for scientific archaeologists who both seek public funding and require public laws to preserve the cultural resources that we know are so important to our communities. For this reason, I want to highlight several blogs that are dedicated to bioarchaeology or bioarchaeology themes. So if you’re interested in the field of bioarchaeology, tune in, and don’t drop out. And if you’re not interested in bioarchaeology but some other aspect of scientific archaeology, then I guarantee there’s probably a blog for it out there. If not, then why not start one yourself.